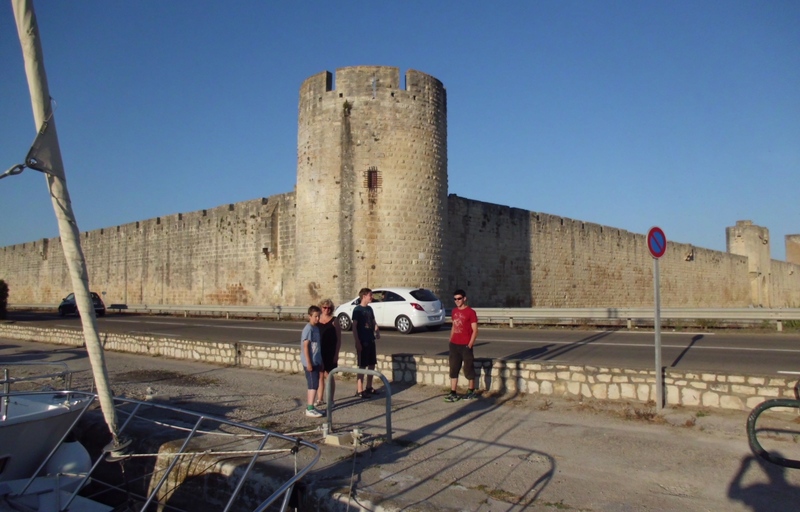 After overnighting nearby the night before in a chilled-out Irish-owned château, we began our journey on a warm morning in Port Cassafières near Béziers. The cruise we were going on was called the “Flamingo Cruise”. Starting at the very end of the famous Canal du Midi, it promised an unforgettable journey through canal, open lagoon, river and marsh and ending alongside one of Europe’s greatest areas of natural wilderness – the Camargue; where the black bull, the white horse and the pink flamingo roam free. It’s an area also known for having the most vicious and numerous mosquitoes this side of the Nile and we had prepared ourselves accordingly, with insect repellent in various forms, treatment for after-bite and bunches of lavender to place strategically around the boat to help ward off the flying pests. After a brief but unhurried training session with a très patient instructor named Jean-Louis, it was time to cast off. “Lâchez les cordes!” I yelled to the assembled crew (I was learning fast). My three teenage sons stared back at me blankly before I instructed them to let go the ropes and coil them neatly at the back of the boat. Soon we were pottering along the Canal at 8km/hour, floating into adventure. Our first stop was Agde – an ancient town of dark stone with cobbled winding streets in its mediaeval centre at the estuary of the Hérault River and within a couple of kilometres of the beaches. We arrived in the evening and after tying up with some neat team-work from the entire crew, we had dinner on board accompanied by some nice local red wine and fine French fizzy drinks. 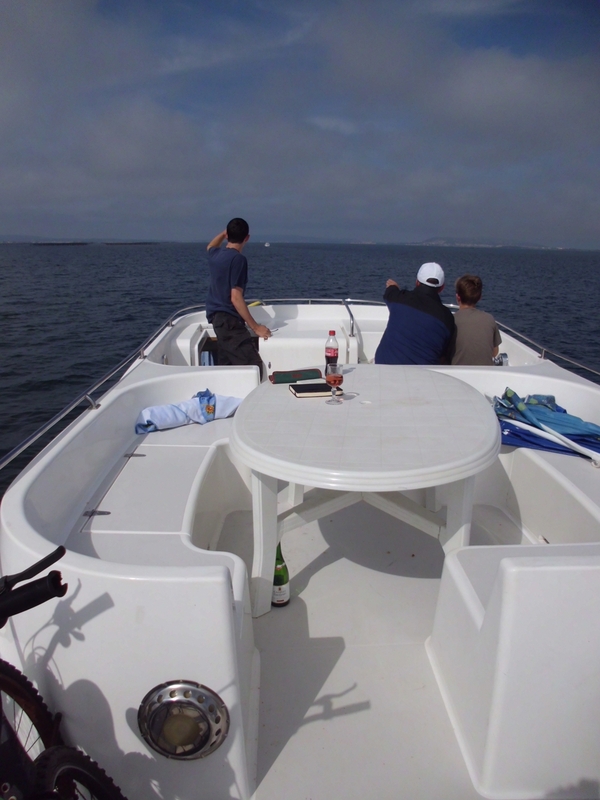 All the boats are well-equipped in terms of cooking facilities and there is plenty of room. The upper deck of the boat had plenty of space for dining al fresco in the warm Mediterranean air. The next morning, we went for a cycle around the centre of Agde, picking up some more essentials such as fresh bread and croissants, washing-up liquid and wine. One of the great things about France is that you only need to pick out something local for about €3 and you’re unlikely to go wrong. It’s also a great country for soft drinks, with a great range that includes the fabulous Orangina (now available in rare spots in Ireland) and their range of “sirops”. The next morning, the lock at Agde (one of only three on this cruise) opened. We motored along via a short piece of the afore-mentioned Hérault, before sailing through the first stretch of preserved wilderness of the journey. The Réserve Naturelle de Bagnas is a quiet marshland with abandoned stone houses, the occasional crumbling fisherman’s hut and lots of wildlife. This soon gives way to a busier stretch past houses and hundreds of boats lining either side of the canal in various stages of decay and splendour, like some exhilarating long and crazy art installation on canal life in all its glory. Glimpses of lagoons and beach front were opening up tantalisingly on either side. 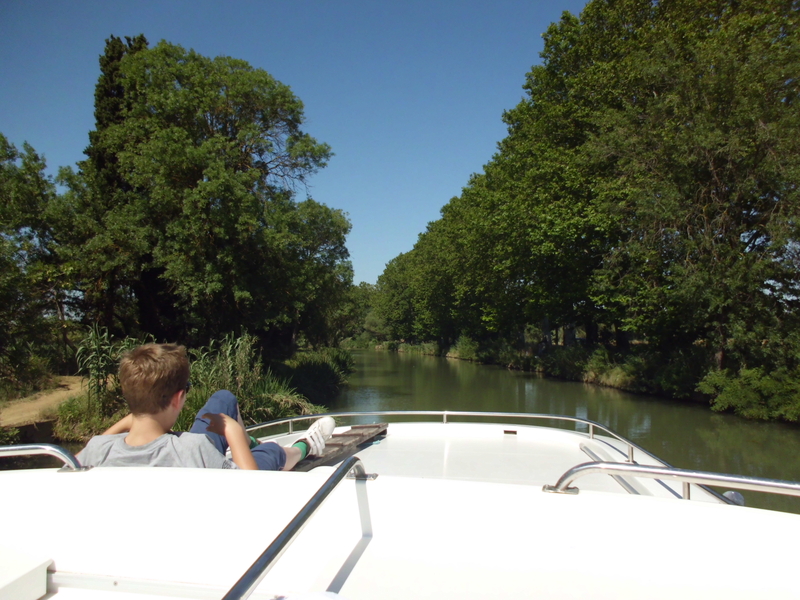 Then it’s all change as you reach the end of the Canal du Midi and are suddenly out in the lagoon of the Étang de Thault. It’s France’s second largest lake and it’s a huge stretch of salt water that feels like the open sea – which it almost is, being separated from the Mediterranean proper by only a thin sliver of sandy coastline that is barely perceptible on the distant horizon. We headed to the northern shores of the lagoon and to Marseillan, where we pulled in for lunch. It’s a wonderful little Mediterranean-style port that gives the instant impression of being in a 1960s Riveria film set; the sort of place where you’d fully expect to see Brigitte Bardot or Gina Lollabrigida teeter down the quays on stilettos with a toy dog at the end of a lead. It’s also the home of Noilly Prat. Any James Bond fan will tell you that the famous vermouth is an essential ingredient of 007’s shaken-not-stirred Martini and Marseillan is the only place in the world where certain types of it can be tasted and purchased. Mèze was our next port of call. Although it lacks the seductive charm of Marseillan, it does have the advantage of a sandy beach with warm lagoon waters in an atmosphere of yacht, bucket and spade. All crew members disembarked for a swim. Another feature of life on the lagoon towns is that of water jousting. We finally got to see a live competition of these modern-day knights armed with padded lances and timber shields on the canal at Palavas-les-Flots – a unique spot where the Rhône-Sète Canal, the low-lying marshland of the Camargue and the shores of the Mediterranean Sea combine to make a lively mixed atmosphere of sailors, campers, sight-seers, bullfight-watchers, beach-volleyball enthusiasts, retirees and families set against a background of flocks of pink flamingos in the wilderness just adjacent. for wow factor. On the edge of huge commercial salt marshes that turn pink at times, it looks like an abandoned ancient fort in a mysterious rosé desert if seen from a certain angle. Down at ground level, however, it’s a beautiful and lively town with great shops, restaurants and curiosities. The last day’s sailing was through the heart of the Camargue. Everywhere we looked, there were herds of black bulls, knots of roaming white horses amidst the reeds and acacia trees and dozens of different types of birds (including, of course, flamingos) but thankfully, no sign of the dreaded mosquitoes. Whether our various defences worked or they just weren’t around, we’re not sure but we were glad. It was a painful wrench to finally pack up and vacate the vessel that had been home to us for a week. It was a week of real adventure and discovery in a part of France where traditions are strong, showing that you can still find places not too far from home feel excitingly foreign. The slow pace of life on a floating boat and a week with no internet interrupting your thoughts also remind you that there are some holidays which are truly relaxing: you just have to know where to look. We travelled with Emerald Star/ Le Boat. For information and rates, visit Emerald Star (www.emeraldstar.ie) or call (071) 9627633. There are also air connections in the area with both Aer Lingus (www.aerlingus.com) and Ryanair (www.ryanair.com) operating regular direct services between Dublin and Marseilles during the summer months. For the first night, we stayed at the restored Château les Carasses outside Capestang, near Béziers. Owned and run by an Irishman Karl O’Hanlon and his wife Anita, it offers self-catering decadence amidst blissfully peaceful vineyards at reasonable family rates. Château les Carasses (www.lescarrasses.com), Lieu-dit Les Carrasses, Route de Capestang, Hérault, France. 0033 (0)467 0000 67. Prices of s/c suites start at €185/night.